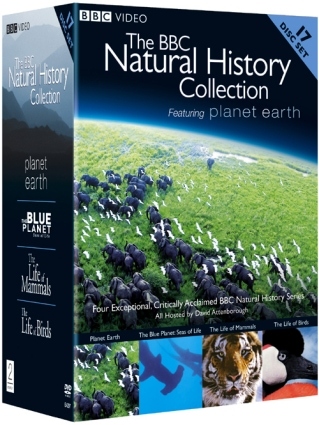 The BBC Natural History Collection is an 18 disc set that includes, Planet Earth, The Blue Planet, The Life of Mammals, and The Life of Birds. This set provides 33 hours of beautiful, educational, and entertaining footage about our amazing planet and its creatures. Product received for review. Post contains affiliate links. Mike and I are both pretty into watching these types of videos. It’s so easy to get caught up in our day-to-day lives and surroundings that it’s nice to be reminded on how vast and impressive this planet really is. Realistically, most people will never travel enough in their lifetimes to see most of it. That’s why I love that series like these are out there. Sometimes I prefer to just sit back and watch the stunning images on our big screen as opposed to real life! Also, you have the commentary to learn from right along with it. My favorite of the bunch was definitely The Blue Planet. I am a sucker for anything about the ocean. (Seriously, don’t mess with me during Shark Week.) I am truly fascinated, horrified, and humbled by it. There is always something more to learn, and even more creatures to discover. It took us a while to watch this entire set, but we enjoyed every bit of it. We don’t have a lot of time to watch hours of TV, but sometimes we like to have “marathons” to catch up on an entire series. After watching The BBC Natural History Collection we would both walk away with more knowledge and appreciation for life. That sounds a little dramatic, but I am serious! They do such a fabulous job on these videos they make me emotional. The music makes it even more intense. I am thrilled to own this set and we will enjoy it for years to come. Love your review ! Fantastic ! How lucky you are to have watched this. My husband and I would enjoy it also ! What a break to watch, compared to the junk on TV nowdays ! Well that worked out nicely! Congrats!!! I would love to watch these and share them with my kids when they’re a little bit older. It’s so important to me to teach my children respect for other living creatures and their environments. I’ll definitely look into this. Thanks!